I have spent the major part of every Goodwood race meeting of the present series – starting, of course, in 1998 – up in the commentary tower, usually as a general dogsbody, simply assisting Simon Taylor with his TV work or Marcus Pye, upstairs on the topmost level, with back-up for the circuit PA commentating that he does so matchlessly well. The present Goodwood Motor Circuit control tower is quite a reasonable look-alike based upon the long-term 1950s/60s original, which it represents rather than really replicates. There were, in fact, several alternative commentary ‘towers’ from 1949 forward, but the longest-lasting became the prototype for the modern, ahem, erection. Back in 1964-66 I was invited up into the tower once, by a BARC friend, but I don’t remember why. I do recall that it was a really rickety structure in those days – constructed from scaffold poles and timber, with rusting corrugated-iron cladding panels, leaking daylight and/or rainwater, just about everywhere. The wind whined and moaned around us, seeking every split, joint and (whisper it) rust-hole. Several of the cladding panels had a corner that had rusted free, so in the wind they tended to flap and clank as background to the commentator’s dulcet tones. 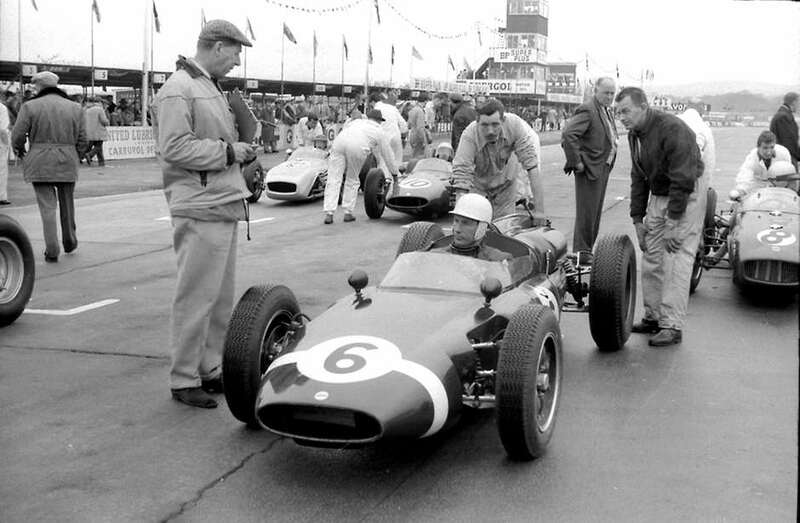 Through later years we used the circuit to test and photograph various cars for various magazines. The annual Earls Court Motor Show-time Guild of Motoring Writers’ Test Day was always quite fun. I vividly recall my first, in 1964, when our ‘Motor Racing’ magazine photographer, Geoff Goddard, offered to ‘take me round’ in the latest Austin-Healey 3000 that had been brought to the event by the BMC people. I slipped into its passenger seat really keen to see what Goodwood might be like from the cockpit of a car at speed. Rugged old Geoff just adjusted his seat right up close behind the steering wheel, elbows bent, intent, eyebrows beetling. 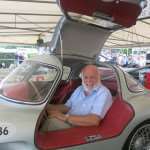 He fired up the car’s engine, smashed it into bottom gear and we rocketed away from the assembly area towards Madgwick, immediately into the frenzied business of overtaking every available victim ahead of us. After our allotted three or four laps we came back in, Geoff grunting that the Healey ‘…seemed all right – bit heavy…’, and I do recall the smell of glowing brakes as we walked away. I thought this was all just flipping MARVELLOUS! At one of those Test Days I clambered up again into the old commentary tower, and was met with the same old sensation – it was swaying perceptibly in the breeze, whispering, whistling, a mouldering old discarded newspaper amongst the dust on the floor. Into the ’70s there one day – I think track-testing the National Motor Museum’s 1908 GP Benz in company with the great John Bolster – I clambered up there again to watch him go pounding by, resplendent in deerstalker and Sherlock Holmes-style tweed cape. It might have been then that I noticed cracked glass panes in some of the tower windows, maybe one or two were broken. Passing years and disuse were taking their toll. Ultimately that old original tower was indeed dismantled, together with most of the old disused pit row, and the scrap was carted away. When it came to building new structures in replacement for what became our Revival Meeting, the architects fully took on board the old general layout, the old look-alike profile, the old atmosphere. But for some inexplicable reason, ahem, they rejected my naïve idea of rebuilding precisely what had once been there, scaffold poles, corry-iron, wibbly-wobbly ladders, yes and probably period-style rust holes too. The present tower is far superior to what preceded it more or less upon that self-same site. It’s a darned sight better built than the old original ever was, and certainly its topmost level – normally Marcus’s circuit PA domain – provides absolutely the best view in the entire house. It’s accessed from the first floor by a vertical steel ladder, vanishing through a square hole in the first-floor ceiling. ‘Dive, dive, dive!’ – ‘Captain on the bridge…’ – even ‘Torpedo los!’ – were common comments through the early years. We’d all been brought up watching movies like Above Us The Waves, Run Silent – Run Deep, and then Das Boot brought all the old naval clichés flooding back (to coin a phrase). Back in period, before some of the larger aerodrome hangars were built, the tower would have enjoyed a better view of the Lavant area, but it is hangar-obstructed today. 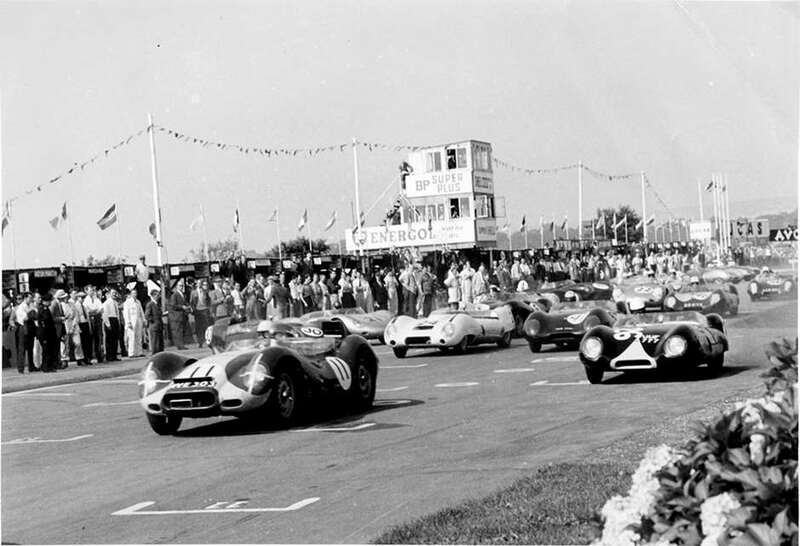 The same is true of the centre of Madgwick Corner, because of the large – and in my view totally invaluable – tree which has grown up just beyond the end of the Race Control building, before the Assembly Area exit gate. One early problem encountered within the new commentary tower was that, should Glorious Goodwood enjoy real Glorious Goodwood weather, the sun would do its stuff and turn the tower itself into a stupendously efficient greenhouse. Its occupants would just about melt up there. Even worse, for the way in which modern commentaries are delivered, the lowering late-afternoon sun would strike upon the assorted TV monitor screens from which the likes of Simon and Marcus work. A liquid-crystal display is all very well, but you try reading one showing the lap-timing chart, or interpreting live-broadcast imagery, when a bright Sussex sun is blazing straight onto the screen. It proved impossible, so we took originally to covering up the offending windows with cardboard or newspaper, anything upon which, in the literal heat of the moment, we could lay our hands. 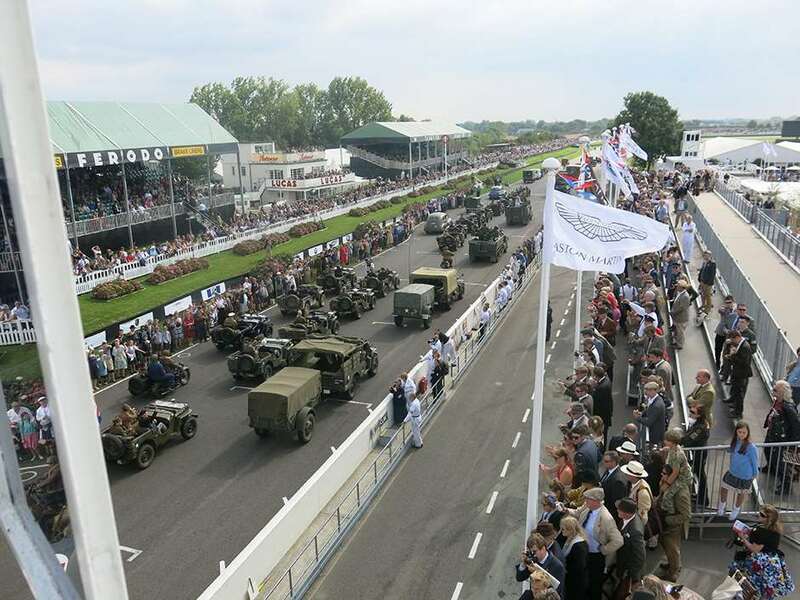 Subsequently, Goodwood’s finest took pity upon the dazzled, over-heated, thirst-crazed (though not for long) commentary teams by applying Mafia staff car-style sun-dim film to the window glazing. It helped a lot, but as with any measure, the law of unintended consequences came to apply. Within the befilmed commentary tower light levels always seem considerably less than one discovers they really are by opening one of the creaky windows. This is starkly evident during our day-into-dusk Revival races, and it’s terribly easy for the commentators to think that darkness has blanketed the circuit long before it really has. This also screws-up any photography that one cares to attempt from inside the tower, because one has to shoot through the Mafia staff-car film, and make allowance for it. Of course there is an alternative. Open the perishin’ window. But if you do that the noise level literally booms, the commentators can’t hear themselves think, and of course their microphones pick it up. ‘Shut that ******* window’ became a snapped demand whenever the thoughtless or forgetful (moi?) should dare to seek fresh air, or a clear camera shot. Even so, the visual scenes, the image memories, that one has accumulated up there over the many years, now survive as vividly as the moment they were first imprinted. 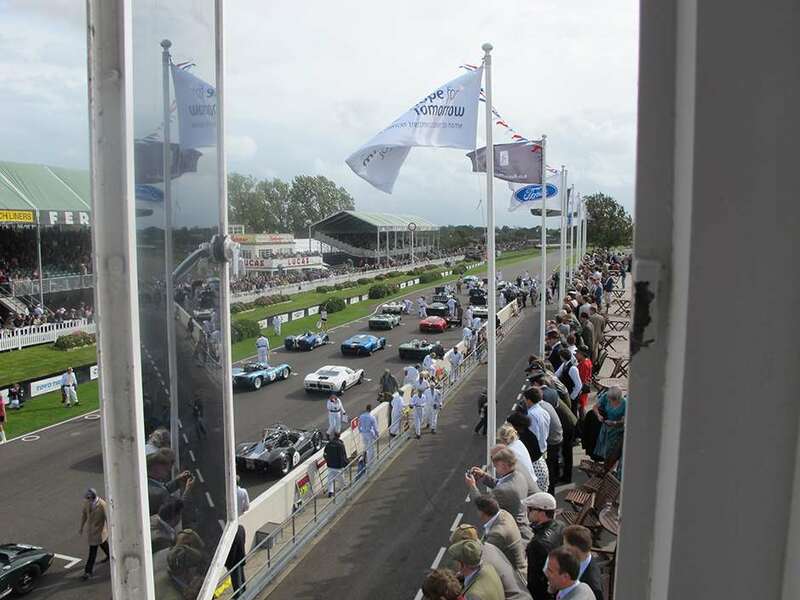 And that, of course, is precisely what Goodwood Revivals and the Members’ Meetings are all about – providing a lifelong legacy of pictures in the mind – some of mine from the room with the best view in the house… God bless that tower.